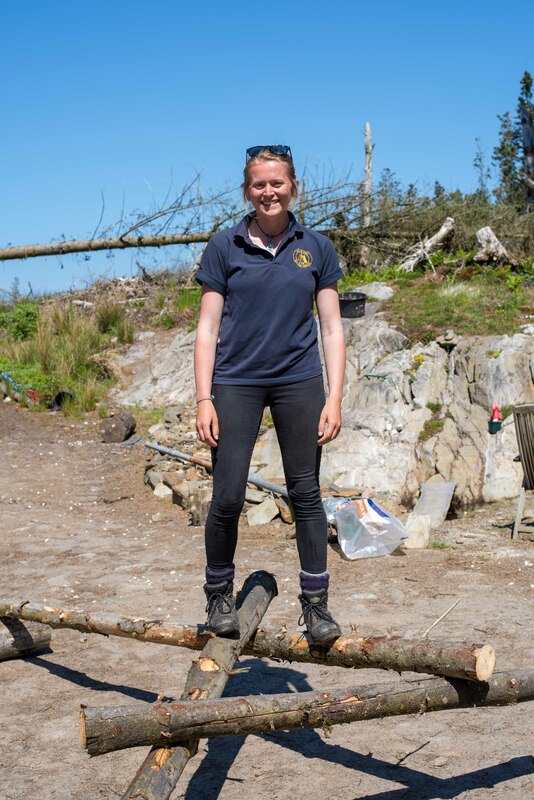 This week it’s my turn for a blog post, a new member of the team – I’m Georgia, the volunteer summer assistant ranger. 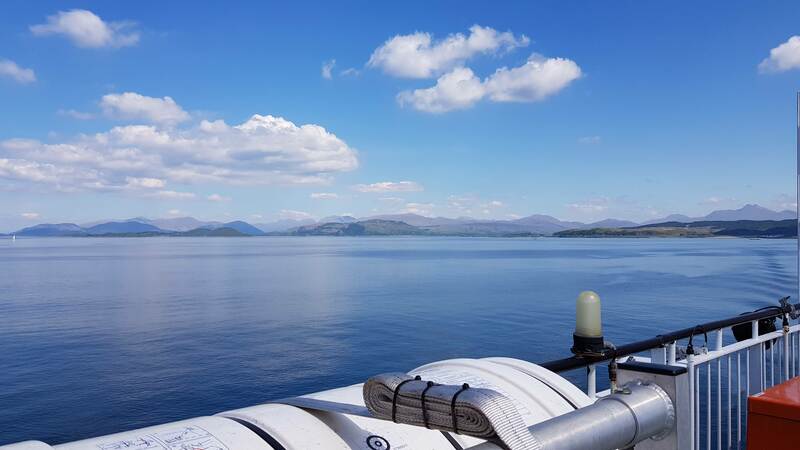 My first couple of weeks in the position have been full of exciting things, complemented by this continuous amazing weather (something I’ve not been used to on previous trips to Mull I must admit). 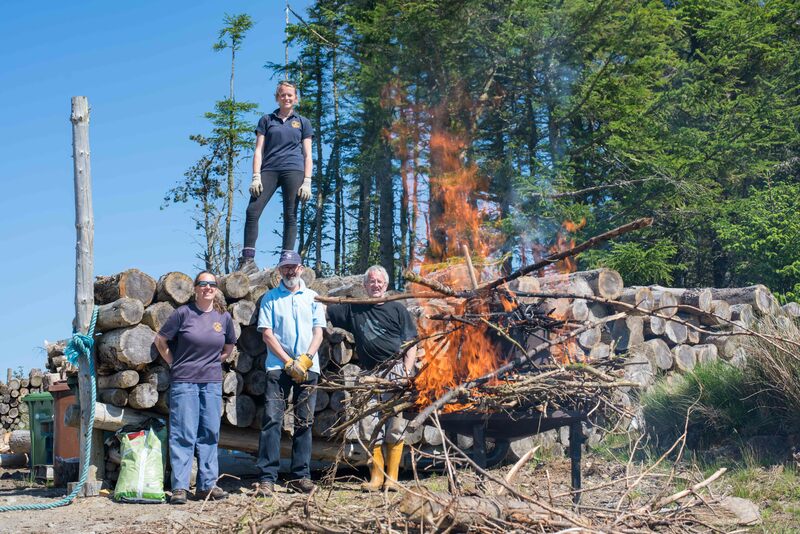 On my first day we had a charcoal making event up at Neil’s place in North Bunessan forest. We built a bonfire over the charcoal oven, and whilst that was burning we had a go at constructing a prototype reciprocating (self-supporting) roof for Neil’s roundhouse that he is working on. A very chilled out, enjoyable day with frequent stops for tea and cake of course – I’ve been told on a couple of occasions that Mull is ‘cake island’, which I’m beginning to believe and am more than okay with! Last Thursday was World Otter Day up at Bunessan Primary, so we spent the afternoon up there helping with various activities – I was on face-painting, and by the end of the day we were surrounded by lots of little otters running around! After school nature club came afterwards, this week with the theme being midges, so we went for a walk and found lots of bogmyrtle and insectivorous plants such as butterwort and sundew, followed by a fun quiz full of weird and wonderful midge facts. 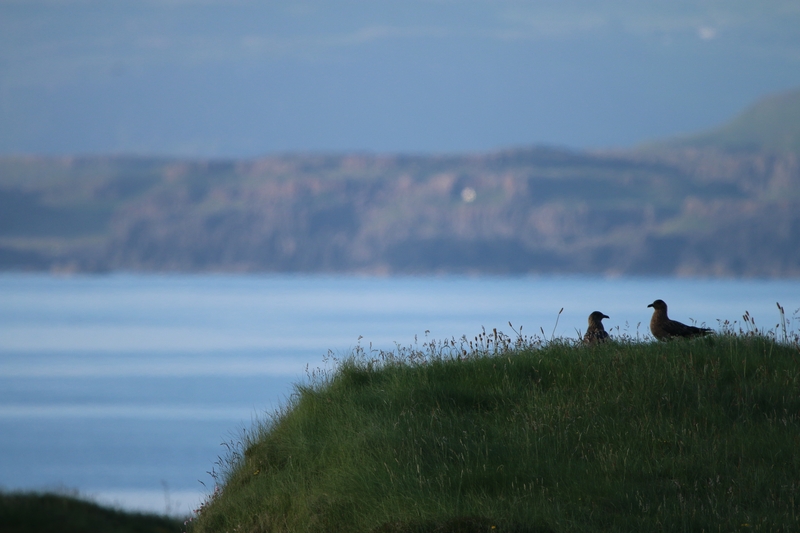 On Monday, Emily and I went over to Iona to do a shag colony survey and then a midnight corncrake survey, where we were very kindly given dinner and a place to stay by staff at the Abbey. Iona is such a lovely wee island, it was great to see in the sunshine and all the wildlife that came with it – countless meadow pipts and skylarks noisily parachuting all over the moors, stylish wheatears doing their best poses perched on fence posts, my first red admiral butterfly of the year and then of course hearing that unmistakeable rasping of corncrakes at dusk. What a place! 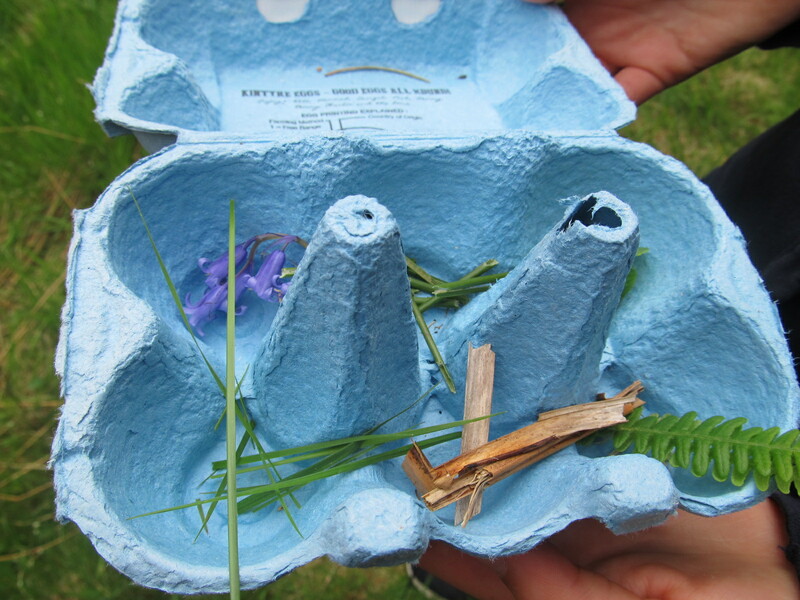 This week we had a school trip with Class 2 (P5 to 7) to Tiroran forest, based on the lovely ‘Lost Words’ book by Robert MacFarlane and Jackie Morris, so the focus was all about using describing words when considering nature and the kids got to make a book each from the activities set out for them. 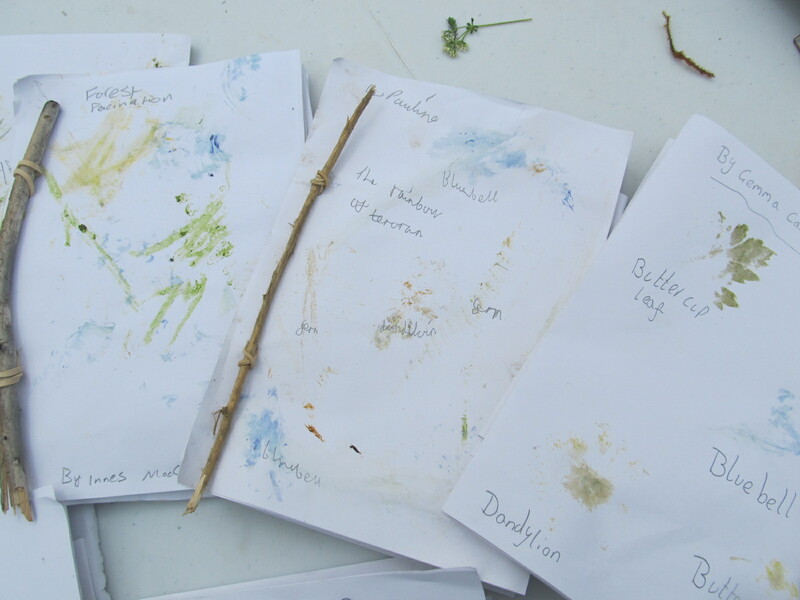 These included using a stone to rub various plants onto paper for their cover pages, along with finding different things on the forest floor to draw and describe. After lunch we assembled the books and visited the eagle hide, managing to catch a glimpse of the chick. 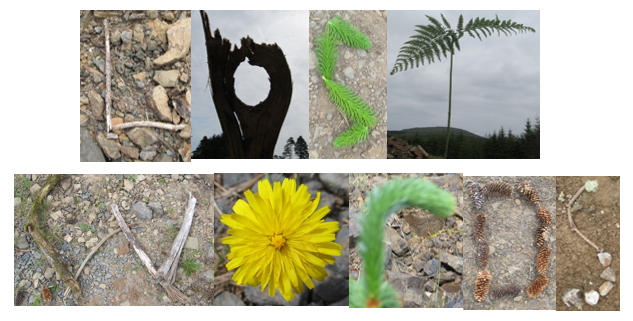 The kids also had a lot of fun keeping an eye out for letters formed in natural objects, taking photos of each one to compile together to make the alphabet. A successful and fun day had by all, despite the midges determined to stop us! 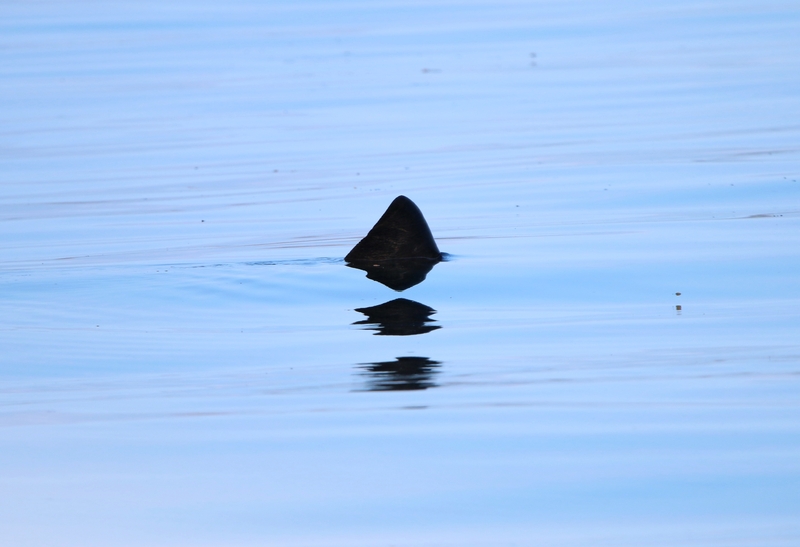 Shark’s fins often tilt because of the size! Finally, the highlight of my time on Mull so far has to be the evening trip to Staffa, an event run by the ranger service in collaboration with the Hebridean Whale and Dolphin Trust and the Turus Mara. 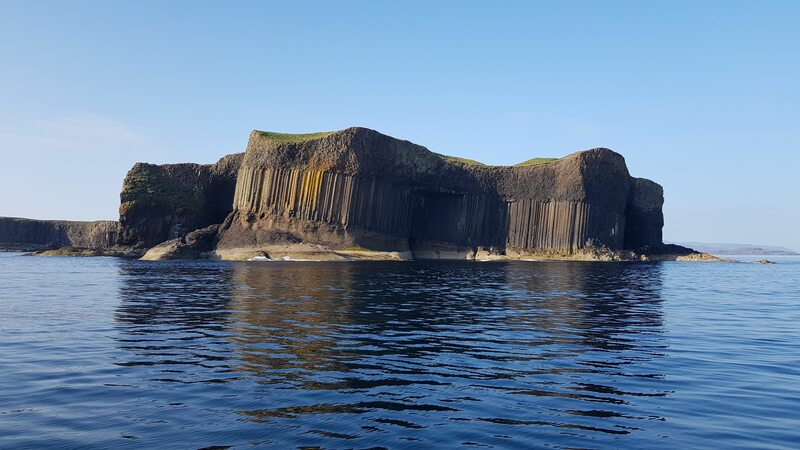 We set out in the blazing sunshine, eyes peeled and eagerly scanning the water, which was getting calmer and calmer as we got ever closer to Staffa. That was when we heard the shout we’d all been waiting for from Colin, the skipper – BASKING SHARK! Everyone scrambled to get a view as the huge and distinctive dark triangular sail for a dorsal fin cut through the mirror-calm sea. It was honestly exciting beyond belief. From then, the basking sharks just seemed to multiply, cropping up all over the place as they cruised along scooping up microscopic plankton. In the end, Pippa (community engagement manager for the HWDT) reckoned we had seen at least 8 different individuals, as well as several glimpses of porpoises and a Minke whale. Not bad for one boat trip I’d say! 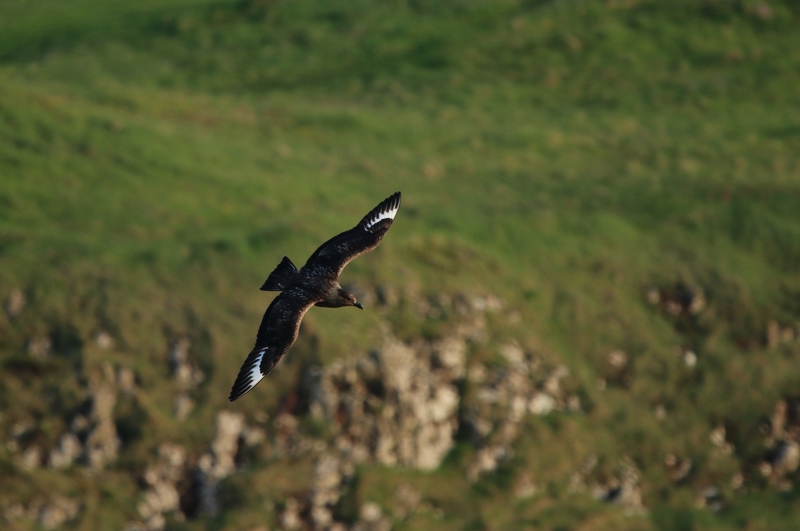 Whilst we were on Staffa myself, Cian and Meryl from Mull Eagle Watch set off to circumnavigate the island, counting nesting Shags and Fulmars on the cliffs. We didn’t have long on the island (as we’d spent too long gawking at basking sharks from the boat, a fair excuse I reckon), so we had to yomp around at quite a pace – however, that didn’t stop the wildlife encounters. As we walked round, we flushed a couple of snipe and came across lots of pipits, various gull and wader species and a pair of beastly Bonxies (great skuas). We must have passed close to their nest site, as they began to circle and swoop low over the ground towards us – time for Cian to get a few pics then get out of there! As we came back to the pier, there were lots of puffins still sat on the water and a few harbour seals chilling on the rocks in the evening sun, with the backdrop of a large tell-tale dorsal fin further out in the water. Back on the boat, Colin very kindly did another round-trip of the island so that we could have a count of the nesting survey species from a different angle, then we set off back towards Mull. 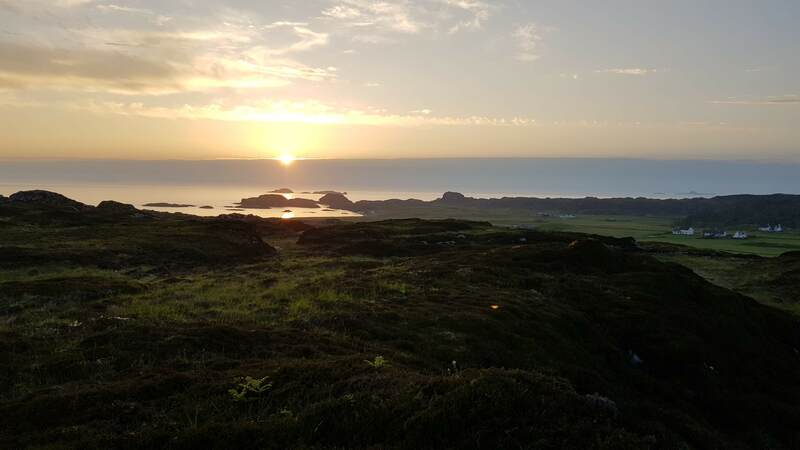 It was amazing to see the sun setting over Staffa and the Treshinsh Isles, but even more amazing when Pippa shouted ‘BREACH! 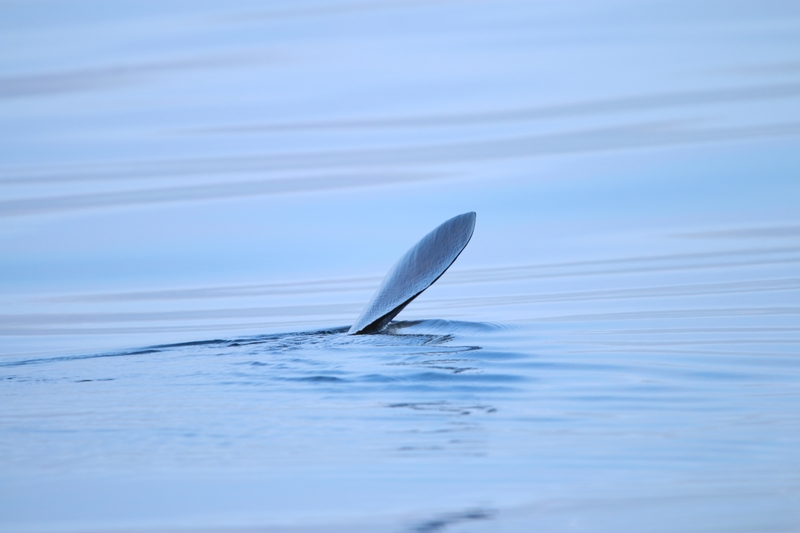 !’ in time for us to see a basking shark actually breach out of the water! I couldn’t believe it, seeing this massive ancient fish haul itself into the air and land with an enormous splash under the sunset. It was such a rare event to witness, and for that all of the staff and passengers on the trip couldn’t be luckier. Overall, a fantastic evening – I expected it to be good, but not that good! 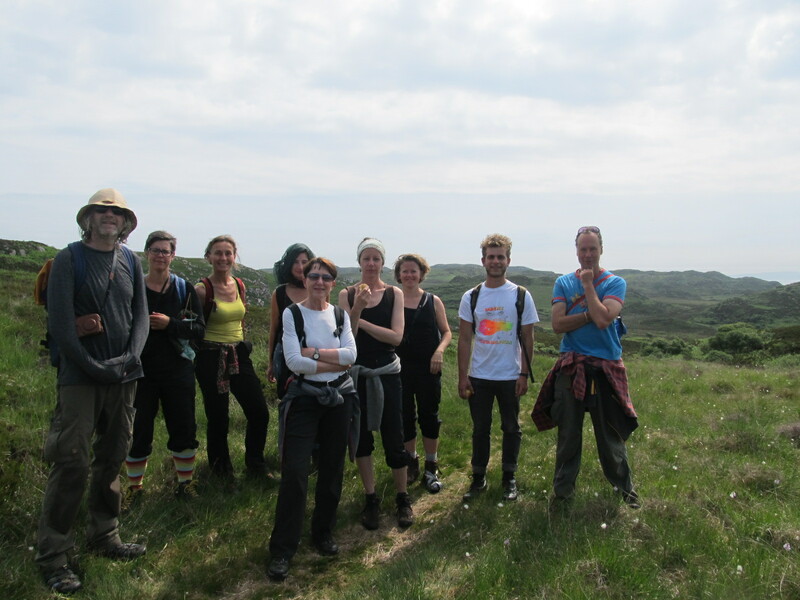 This morning we had a lovely walk at Tireregan nature reserve with a group of artists from the UK and Norway. We walked to the old oak tree, pointing out interesting wildlife and plants along the way, and it was nice to hear about similarities and differences between Scottish and Norwegian landscapes. We then walked to get a view of the old village, and on the way back came across lots of golden ringed dragonflies, a cuckoo and a distant male hen harrier. Anyway, enough from me and apologies for the lengthy blog post, but there has been a lot to write about! I’m looking forward to whatever else the summer brings. Photo credits to Charley for the charcoal day, Emily for the Tiroran school trip/Tireregan walk and Cian for the shark and skua pics. ← Wildlife is full of suprises!